2/2/17: the groundhog saw his shadow - more winter coming our way! Today is Groundhog's day in America. I teach English language learners (ELL) and trying to explain this "holiday" is a tricky one. Students are confused on why we "communicate" with a groundhog. It's one of those silly days that I don't bring up unless one of the students ask about it...rather not even go there. Groundhog's Day the movie, features Bill Murray who plays an arrogant weatherman. 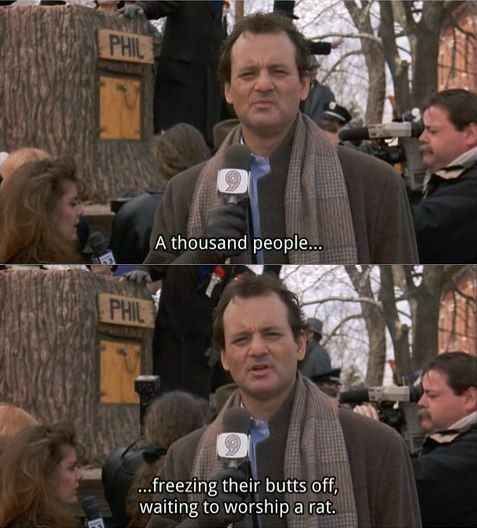 He is on location in Punxsutawney covering the Groundhog Day event and finds himself in a time loop - repeating the same day over and over again. After going through a rough patch, he begins to re-examine his life and priorities. The idea is basically what would you do different if you could get a "re-do". I've never actually seen the entire film, only bits and pieces. But it got me thinking about my recent outfits that I've been wearing on REPEAT. I find myself reaching for these items, OVER AND OVER again - much like Bill Murray experiencing life, repeatedly, in the movie. Lately, I cannot stop pairing oversized turtlenecks and over-the-knee (thigh high) boots. I LOVE the way this combination looks. The oversized sweater on top is comfortable and once you pair it with OTK boots - it gives it a more structured and "put together" look. This combination is perfect for work - I've worn a few outfits like this to work (aka school) and have gotten SO MANY compliments. I've made separate posts about turtlenecks (read it here) and over the knee boots (read it here) - you can check those out for more information regarding my favorites in each of those categories. What have you been wearing and RE-wearing lately? What has been your go-to outfit? Share in the comments below!